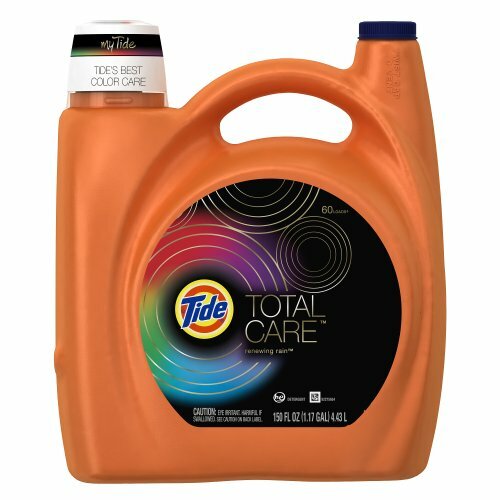 Tide Total Care is a breakthrough, new laundry detergent that goes beyond outstanding cleaning and stain fighting to help reveal the 7 signs of beautiful clothes. By combining the best of Beauty Care and Fabric Care technologies, Tide Total Care elevates the standard of fabric care to an inspiring, new realm: Fashion Care. Tide Total Care resolves the compromise by providing outstanding cleaning/stain fighting and helping to keep your clothes beautiful over time. Tide Total Care is a hard working detergent to use everyday that will help your clothes stay beautiful; whether it's your comfy T-shirt or your favorite Jersey dress. Tide Total Care helps reveal the 7 Signs of Beautiful Clothes - Cleans Thoroughly, Protects Color, Preserves Shape, Maintains Finish, Enhances Softness, Prevents Pills, Fights Stains. Tide Total Care keeps your colors like new. Available in our Renewing Rain scent. Tide Total Care can be used as an everyday detergent. Maintains Finish-- Helps maintain the smoothness and overall texture of your clothes by reducing the friction between fibers that occurs during washing and daily wear. Cleans Thoroughly -- Provides an outstanding clean by lifting dirt and soil from clothing, breaking it down to help keep it from re-depositing onto clothing. Enhances Softness--Conditions your clothes to leave your clothes soft and comfortable. Prevents Pills--Gently "exfoliates" your clothes to help prevent the build up of pills and fuzz while conditioning fabrics to help keep fibers from breaking and fraying. Fights Stains--Contains powerful enzyme technology that provides outstanding stain fighting power you expect from Tide.